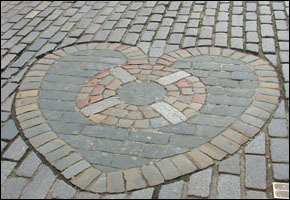 This heart set into the street cobbles on Parliament Square marks the site of the entrance to the Old Tollbooth Prison which was built in 1561 originally as a Custom House for merchants. It then became the Townhall where the Privy Council, College of Justice and the Scottish Parliament met, but by the mid 17th century it had become a prison and the place of execution. On the northwall of Parliament Square were where the heads of the recently deceased criminals used to be displayed, but this building was demolished in 1817. The heart is a memorial to the many hearts which must have been pounding away on this very spot before being executed.